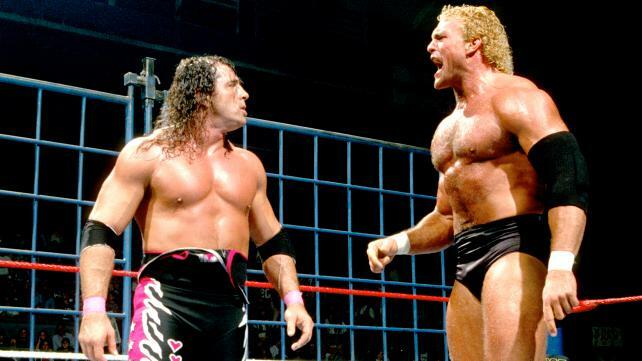 You could cut the tension with a knife as Bret Hart challenged WWE Champion Sycho Sid in a Steel Cage Match just days before WrestleMania 13. With Stone Cold Steve Austin watching from the back, Hart tried to wear down his much larger opponent with punches, kicks, and even an eye rake, but Sid caught the "Hit Man" every time he scaled the cage. Pandemonium broke loose once Sid dropped Hart with a mighty powerbomb, as Austin, now at ringside, refused to let the WWE Champion climb over the top of the cage. Hart soon recovered and joined the fray, opting to help "Stone Cold"- his WrestleMania opponent- double team Sid while all three Superstars teetered atop of the cage. Matters got even more outrageous when The Undertaker ran out and climbed to the top to help Sid fend off the attack. After Bret delivered a massiver superplex to Sid, it looked like it could be anyone's match with both competitors exhuasted, but the Phenom slammed the caged door on Hart as he tried to escape, clearing the way for an unbelievable victory for the WWE Champion.